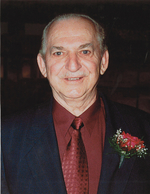 Leo Macsymach passed away at the Brandon Regional Health Centre on Thursday, February 28, 2019 at the age of 84 years. Leo was born in Horod, Manitoba on July 1, 1934 to John and Ann Macsymach. Leo received his education in Morse and Elphinstone, after which, he and his sister Jean operated cafes in Elphinstone and Sandy Lake. Leo married Sonia Twerdochlib on October 14, 1961. Together they owned and operated the Sel-Rite Store in Sandy Lake from 1962-1982. Leo also drove a school bus for Rolling River School Division in Sandy Lake where he raised his family. Leo enjoyed music at a very early age and played in his first band at the age of 14 years. His love for music was shared with his boys as they joined forces with a family music band in the mid 1970’s called The Trail Riders. In 1983, his family moved to Brandon where Leo had various jobs until his last employment with the Brandon School Division as a custodian for George Fitton School. Leo was known to the students and others as "Mr. M.". He also enjoyed travelling and the time spent with the Canadian Ukrainian Men’s Club of Brandon. Leo leaves to mourn his wife of 57 years Sonia; children Duane (Bev), grandson Stephen; Brent (Kim), grandson Aiden; Darren; and Jason (Tryna), granddaughter Paige. Also left to mourn are his brother Peter’s family; sister Jean Derhak; brother Rudy (Josephine) Macsymach; sister Sonia (Matt) Dutchak; sister Sylvia (Murray) Matiowsky and their families. Leo was predeceased by parents John (1983) and Ann (1965) Macsymach and brother Peter McSymach (2018). The Funeral Service was held on Monday, March 4, 2019 at Memories Chapel. Rev. Fr. Michael Tkachuk officiated with Stella Fedeniuk as Cantor. Urn bearers were Paige Macsymach and Aiden Macsymach. Honour Guard and prayers were offered by the Canadian Ukrainian Men's Club. Interment followed at the Brandon Cemetery. Donations in Leo’s memory may be made to the Heart and Stroke Foundation of Manitoba 1379 Kenaston Boulevard, Winnipeg, Manitoba, R3P 2R5 or to Diabetes Canada Unit A1 - 800 Rosser Avenue, Brandon, Manitoba, R7A 6N5.